Did You Know That Even Your Wealthiest Clients Must Enroll in Medicare to Get Health Coverage Starting at 65? I recently got an excited phone call from a friend. She'd heard that Horsesmouth was training advisors on how to give smart, insightful guidance to their clients about the ins and outs of Medicare health insurance coverage. "Wow, that's great to hear because you wouldn't believe the types of expensive mistakes people can make," she said. "Let me tell you my story." My friend reminded me that a few years ago she'd taken over managing the affairs of her elderly father—a retired scientist from California. She said when she started managing her father's issues, she discovered that in addition to Medicare, he had two other health care insurance plans. So she tried to get advice about those health insurance plans while also trying to organize the rest of his finances. First, she tried her own advisor, but he couldn't help her. Then she approached her father's CPA, thinking maybe he'd know something. But he couldn't help her. She even asked the HR people at her father's former employer. Again, no help. Not wanting to mess up her father's health coverage, she left things as is. Every month she saw direct debits made against his checking account for the monthly premiums. But as anyone else who's ever taken over an elderly adult's personal business knows, there were lots of other pressing issues. So it remained a mystery—but it stressed the heck out of her because her gut told her something wasn't right. Anyway, time moved on and she finally found someone through a professional networking group who could advise her on the plans. Now for the eye-popping number: That mistake cost at least $25,000 dollars over ten years. Naturally, that money could have been used for many good things, including savings and investments. And it could have helped lower his monthly retirement expenses…which had become a critical issue: He'd suffered a stroke, had an expensive second wife, and had never planned his retirement, despite retiring with a large nest egg now depleted. None of us want this sort of thing to happen—especially to our clients. Look at the list of people and places she tried to get help from. They were all experienced professionals, but they didn't have the expertise she needed and expected them to have. And her father was a smart guy, too—an actual rocket scientist—a nuclear physicist who'd spent his whole life fighting (and winning) the Cold War! But he could not figure things out and made a very expensive mistake. In the end, the advisor who helped my friend has her business—and thanks— forever. Not to mention a high number of referrals! What did this advisor have that the other professionals in this story didn't? It wasn't a vast technical knowledge about all the ins and outs of insurance plans. But it was enough knowledge to confidently ask the right questions of my friend and quickly discern that her father was paying for a duplicate health plan that was the equivalent of pouring the money down a drain. This is the level of Medicare expertise we want you to have—so you, your clients, and any prospects can have an independent, unbiased professional to guide them on their way through the Medicare labyrinth. Like Social Security, Medicare is far more complicated than most people realize. Yet new retirees are largely unprepared to deal with this mandatory health care program, especially if they've been automatically covered by health insurance at work. The biggest shocker is that Medicare is not automatic; you have to sign up for it within a specified period of time. And it is not free; there are monthly premiums, deductibles, and copayments. And it does not cover everything. Supplemental insurance is essential, but choosing the right policy is no easy task. And even then, long-term care expenses are not covered. Regardless of how healthy your clients are now, they must prepare for serious medical costs in retirement. This is one of the most critical aspects of retirement planning, because all it takes is one unexpected, large medical expense to decimate a client's assets and derail a financial plan. And there's much more. But here's the other problem: Most advisors don't know the answers to these questions either. Who Helps People Figure This Out? Your clients and prospects need you to help them integrate Medicare and overall health care financial planning into their retirement plan. It's called Savvy Medicare Planning for Boomers. And if you're familiar with Elaine's hugely popular Savvy Social Security Planning for Boomers program, you'll get a sense of what she has planned for you and your clients regarding health coverage and Medicare. Any advisor working the retirement income planning niche needs to understand how Medicare works, what the program's limitations are, and how your clients can fill in the gaps to preserve their financial security. Deliver excellent service by providing information, resources, and guidance geared to each client's unique circumstances. Have a reason to contact them every year during the annual enrollment period. Establish a niche for yourself based on unusual expertise that blends health care guidance with financial planning. Reach out to pre-retirees who need to plan for health care before leaving the job; this allows you to establish a relationship before they are faced with the rollover decision. 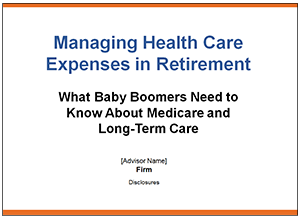 Address baby boomers' questions and concerns about how to manage health care expenses in retirement. This program consists of four modules designed to educate you about Medicare and supplemental insurance, prepare you for in-depth client discussions about how to manage health care in retirement, and help you reach out to prospective clients and centers of influence by offering an essential service that is not provided by most financial advisors. Like all Horsesmouth programs, the client presentations and related materials do not focus on product: you will set yourself apart from product-driven seminars in your community by offering planning services geared to each client's individual needs. How you choose to be compensated for these services is up to you. Fifty-seven percent of baby boomers said they had a "poor understanding" (31%) or know "almost nothing" (26%) about Medicare, according to a recent survey by Bankers Trust. Three-quarters of boomers (72%) did not know that most Americans on Medicare pay premiums, copays, and deductibles. One in seven thought Medicare was free. Only 14% knew that Medicare does not cover long-term care. The title tells it all. Designed for busy people who just want the highlights, this new presentation condenses the material in our main Medicare presentation and tells attendees what they need to know…and no more. Key points they'll walk away with: Medicare isn't free; Medicare leaves gaps; if you don't sign up on time you'll pay more; before retiring, it is crucial to estimate what your health care expenses will be in retirement; how to start thinking about long-term care. One of the most confusing aspects of retiring – and the area where the most mistakes are made – is the transition from employer health insurance to Medicare. Employee benefit managers mean well but they are often uninformed about Medicare. Health insurance agents have their own plans to sell. This presentation positions you as an unbiased source of information and guidance on transitioning to a new health insurance system at retirement by alerting clients to pitfalls and helping them avoid common mistakes. #1: I don't see how Medicare impacts financial planning and investment portfolios. Sadly, health care costs in the U.S. are completely out of control. For retirees, health care is their greatest, ongoing expense. And when they started saving for retirement, they had no idea how large, fast-growing and complicated retirement health coverage would get. It's a growing drain on retirement income, thus a key element of retirees' financial planning. Just consider this: From 1965 to 1985 health care costs tripled in real (inflation-adjusted) terms from $187 billion to $666 billion. And then, over the next 20 years, spending nearly tripled again to $1.9 trillion in 2005. It's eating a hole in everyone's pockets: corporations, governments, and individuals. As we've seen—and as you may well know—mistakes can be costly. So managing health care costs in retirement is actually a key need of just about everyone. Savvy Medicare Planning for Boomers will train you on how to be the valued, appreciated resource on this topic in your community. #2: I can't see how this is going to help me do more business—I don't get paid for offering Medicare guidance. If you're pursuing the lucrative, competitive retirement niche, then you've got to bring a working level of knowledge and expertise about Medicare into the mix. Boomer clients, at 10,000 a day reaching age 65, will demand it. Savvy Medicare Planning for Boomers will add a concrete, valuable service to your business that clients will deeply appreciate. #3: The Medicare season is only in the fall, so no need for a year-round program. The annual coordinated election period—sometimes called "Medicare season" because it's when Medicare Advantage plans give seminars around the country—may be in the fall, but clients need help year-round when it comes to managing their health care costs in retirement. Perhaps more important are baby boomers turning 65 — those 10,000 a day. Many of them simply do not know that there could be penalties for not signing up for Medicare within their initial enrollment period. People who've never had to think very much about health insurance while they were working are in for a rude awakening when they realize that they must be proactive about Medicare. This means understanding all the parts and the gaps, evaluating coverage and pricing for multiple plans, and making decisions based on their anticipated health care usage. It's really huge. If you can help prospects and clients with this crucial aspect of their retirement plan, you'll be the preferred advisor for rollovers and other business. Yes, it is. And so is just about every other aspect of your business; guiding clients on complicated financial matters is the value proposition you bring to the marketplace. Financial advisors who see the wisdom of adding Medicare expertise to their line-up (as so many have done with Social Security) position themselves as client-focused retirement niche specialists. It's a big differentiator when you can calmly explain to a prospect that Medicare and Social Security are potential, expensive minefields for retirees and that among the many great things you do for clients, is offer them important guidance in these retirement areas so they don't fall victim to making expensive mistakes. Savvy Medicare Planning for Boomers helps you (and your clients) see the program in clear, easy to understand terms. #5: Clients get Medicare information from their employer before they retire. Sometimes. But the information and guidance are often of mixed value. Just like you wouldn't send your clients to the IRS for help on minimum required distributions, you don't want to send them to the HR department for Medicare issues. (In some cases it might be helpful, but in the end, the HR department doesn't have a sense of your clients' big picture needs in retirement.) Plus, as you'll soon learn, things change in Medicare and your clients need help with information that is current. The Savvy Medicare Planning for Boomers program will give you the insights and knowledge you need to be your clients' valued advisor on this critical issue. #6: My clients are wealthy and won't have to worry about Medicare. Unless your clients' pockets are so deep that they will fund 100% of their retirement medical expenses completely out of pocket, then they'll need to know, understand and make choices about Medicare. The wealthiest, HNW retiree who wants any sort of private health insurance coverage is still required to sign up for Medicare. So, nearly all your retirees need to sign up for Medicare. You don't want them asking other professionals for help about this. Better you provide that guidance. Besides, when it comes to explaining management fees to clients, it's good to be able to point out the extra service and advice they receive on such issues as Medicare guidance. #7: I don't want to get into the business of being a Medicare plan advisor, especially around prescription plans. Unless you're talking about getting into the business of selling health insurance to your clients (which brings with it an additional level of important regulation regarding when and how you talk about Medicare) you're not "specializing" in Medicare. You're not the Medicare Plan Advisor. You're a retirement niche specialist who helps clients craft a retirement income paycheck and manage all the various, important moving parts of a successful retirement lifestyle. Being able to educate and alert your clients to potential problems and changes in Medicare each year is a valuable service. And that's what you're delivering. #8: Medicare is changing all the time—how will I keep up with it. Yes, it's true that Medicare keeps changing. That's all the reason why you'll want to inform clients and prospects about new changes so they don't make serious, expensive mistakes while deciding how best to arrange and pay for their health care in retirement. 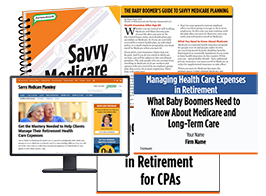 The Savvy Medicare Planning for Boomers program will be your guide and source for what's new and what your clients need to know in making critical decisions. If you're familiar with Horsesmouth's Savvy Social Security program run by Elaine Floyd, CFP®, then you can imagine, to some degree, what our Savvy Medicare Planning program is like. For starters, Elaine will be leading the program participants through a 4-part webinar training program. Here's an outline of the training program: Each part consists of a one-hour webinar and study guide plus marketing materials and worksheets. Why clients must pay attention to the annual enrollment period and how you can meet with them each year to help evaluate the new terms and costs imposed by their existing insurance company. The training program above is just one part of the Savvy Medicare program. You'll also receive a full client workshop program—PowerPoint slides and speech—plus a great client handout called the Boomer's Guide to Medicare, and a full marketing and client communications campaign. And all the client materials, of course, are FINRA-reviewed. Managing Health Care Expenses in Retirement presentation is ideal for workshops, seminars and other public events. It also works for one-on-one sessions with clients and prospects ($299 value). Managing Health Care Expenses in Retirement for CPAs presentation is edited to engage CPAs, as well as marketing materials and our CPE credit guide. Note: If you are presenting “Managing Health Care Expenses in Retirement” to CPAs for CPE credit, you must use the CPA-specific presentation in the below zip file, which contains additional dicussion questions to satisfy NASBA requirements ($299 value). 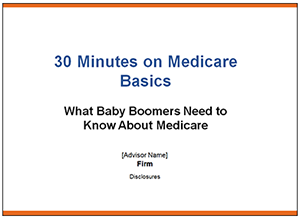 30 Minutes on Medicare Basics is designed for busy people who just want the highlights. This new presentation condenses the material in our main Medicare presentation and tells attendees what they need to know…and no more. Key points they'll walk away with: Medicare isn't free; Medicare leaves gaps; if you don't sign up on time you'll pay more; before retiring, it is crucial to estimate what your health care expenses will be in retirement; how to start thinking about long-term care ($299 value). 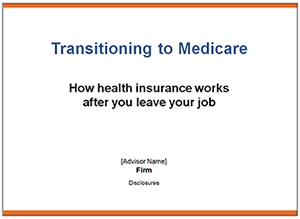 Transitioning to Medicare positions you as an unbiased source of information and guidance on transitioning to a new health insurance system at retirement by alerting clients to pitfalls and helping them avoid common mistakes. ($299 value). 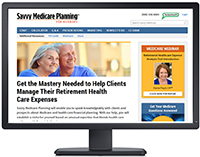 Savvy Medicare Planning for Boomers website is a subscribers-only, resource website for subscribers to ask questions and download updated resources for the program. Bi-Monthly Newsletter: Each issue is packed with information and updates from Elaine Floyd on the latest Medicare news, program updates and answers to difficult questions. The Savvy Medicare Question and Answer Forum: A large collection of Medicare Q&As. 700 hundred advisor questions and Elaine Floyd’s answers are all there. Read through previous Q&As or enter your own question and start learning. Your program is led by Elaine Floyd, CFP®, Horsesmouth's Director of Retirement and Life Planning. Elaine is the author of The Financial Advisor's Guide to Savvy Social Security and The Financial Advisor's Guide to Savvy Medicare. She is often quoted in leading publications. "We had a client couple move to GA for retirement. We gave them instructions on what to tell the SS office in order to start benefits. The office's recommended strategy was faulty. "After several email exchanges between our office and the local SS office they conceded that we were right and gave the clients benefits and past due checks. They were thankful for the information and said they would be educating their staff as well as doing supplementary training. "First of all, thank you for your work and the resource you have become for advisors in the arena of Social Security. I purchased the Horsesmouth curriculum several months ago and have been a student of it since. I am planning to hold my first workshops in September and already have clients and prospects eager to attend. "I also want you to know that I enjoy reading your material because it is so well done and friendly! I say friendly because this stuff is so dry and boring and unattractive in and of itself (unless one is an actuary), and you have made it very user friendly. Thank you again. —Susan Tackett, Visalia, CA. "I have helped several widows who have lost their husbands at a relatively young age, and had either forgotten or simply did not know they could be eligible for the spousal benefits. This has occurred multiple times. Make Savvy Medicare Planning for Boomers a key client-service offering for your pre-retirees and their friends and families. The coming retirement wave presents a unique and sustained opportunity for you to extend and enhance your reputation on critical health care and retirement issues. Learn the program. Present it to your clients and prospects. Use it one-on-one and in group settings—as a client education workshop. Do that for 12 months. If you're not finding that your clients and prospects are extremely grateful to have a competent, confident and knowledgeable advisor guide them through the ins and outs of Medicare planning, we'll completely refund 100% of your purchase price—guaranteed, no questions asked. Just call and tell us you're returning all the materials to Horsesmouth at: Horsesmouth, 21 W. 38th St., 14th Fl., New York, NY 10018. Phone: 212-343-8760, Ext. 1. Your business partly grows based on hard-earned referrals you receive from clients and professional allies. Those referrals are rooted in the deep trust clients have in you. You've earned that trust by overseeing their financial lives, pointing them on the right path to growing their investments and building a retirement nest egg—and smartly drawing down on that savings to fund a regular retirement paycheck. Making that life-changing transition—however incremental it may be—starting at age 65 (when they must sign up for Medicare) will be one of the biggest challenges those clients will face. And making the right choice about health care coverage is a critical step for them. You're the natural person in your clients' lives to offer guidance on Medicare. When you deliver direction on such a sticky, panic-inducing topic like health coverage in retirement, you make a big deposit in the client trust bank—the kind that earns undying loyalty and referrals.